Trees act as natural filters and absorb air pollution and dust. The shade trees provide helps protect us from harmful solar radiation. Another added benefit of trees is the reduction of noise their presence provides. They can provide wind-resistance and cooler air because their leaves reflect heat away from the ground. The stature of trees allows them to decrease and prevent soil erosion and flooding. Many trees that commonly grow in North America and parts of Europe possess medicinal benefits. Fall and winter time is the perfect time to extract roots, bark and twigs for medicinal purposes. People have made tinctures, salves and poultices from these three parts to treat a variety of diseases. There are several types of pruning and trimming methods you can use to keep your trees in top condition. You can do your own tree trimming and pruning if you have the basic knowledge about or hire tree pros. Evergreen means a tree doesn’t lose its leaves during the course of the winter. Most people think of evergreen trees like pine and Christmas trees because evergreen trees thrive in wintry weather and dry weather. Although most evergreen trees are coniferous, there are some coniferous trees like larches that do lose their leaves. Evergreen is the opposite of Deciduous. Deciduous trees, on the other hand, lose their leaves at the end of the growing season and grows them back again typically in the spring. “Deciduous” is an adjective and means that the plant so described sheds its leaves at the end of the growing season. These are the trees that provide elegant foliage when the trees turn red, orange and yellow during the Fall season. However, there are some deciduous trees (some broadleaf trees like the live oak trees) that do not lose their leaves and keep them all year. You can think of deciduous as being the opposite of evergreen. When a tree has foliage that are needles or clusters of needles, those trees are most likely a coniferous evergreen. Single Needles: Needles on a lot of evergreen trees will be attached to a twig. They may look like pegs (spruce), cups (fir) or petioles or leaf stalks (hemlock, bald cypress and douglas fir). Trees in this subcategory of evergreen trees are usually, spruces, firs, cypress or hemlocks. Cluster & Bundle Needles: The leaf clusters or bundles found on pine trees and larches are referred to as fascicles. The number of adult needles per fascicle helps to differentiate between pines and larches. For example, you can expect most pine species to have 2 to 5 needles per fascicle. Larches will have multiple clusters of needles. Keep in mind that larches do shed needles every year, and the needles will eventually turn yellow. When identifying leaves on deciduous trees, start by looking at how the leaves are arranged on the stem. Some leaves grow in an alternating pattern along the stem, and some leaves grow in pairs opposite each other along the stem. Next, look at the structure of the leaves. All leaves have two main sections: the petiole and lamina. The Petiole is the stalk that attaches the lamina to the stem. The lamina is the leaf blade and the flat part where photosynthesis happens. Leaves with an undivided blade are called simple leaves. Leaves that form a collection of leaflets are called compound leaf. 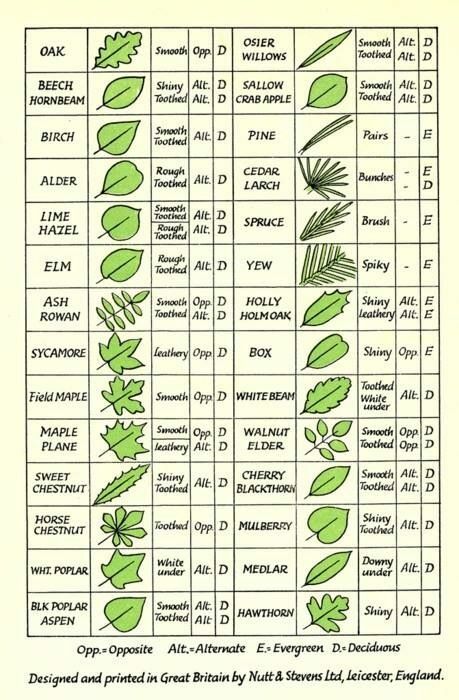 Compound leaves can be sub-classified based on how the leaflets are arranged. Palmately compound leaves are leaflets that extend directly from the end of the petiole. They spread out (in clusters of three or more) and look like fingers on the palm of a hand. Pinnately compound leaves have leaflets that extend from a vein that connects to the petiole. These leaflets are in an opposite arrangement on the petiole, and they may be evenly or oddly paired. Alternate leaves are situated between each other on opposite sides of the stem. These leaves tend to grow in a staggered, alternating pattern. Opposite leaves (whether simple or compound) are located directly across from one another on the same stem. They also tend to grow in pairs on the stem. Examples: Maple, Sycamore and Sweet Gum. In a compound leaf, the leaf is divided into leaflets that are attached to a middle vein by their own stalks. If compound leaves are alternate in form and look like a feather, they are called pinnately compound leaves. Pinnately compound leaves are divided into another subcategory: odd (number of leaflets is odd), twice-pinnate or bipinnate (which means the leaflets are themselves divided into smaller leaflets) and even (which means there is an even number of leaflets on the twig. As stated earlier, the shape of the leaves looks like the palm of a hand. In case you were wondering how to identify your trees when all the leaves are gone, you can always look at the tree’s bark. What you will discover is the bark of trees has a unique pattern—kind of life a fingerprint. Therefore, you will expect no two bark patterns are exactly alike. Even though some tree species have similar types of bark, they all still have their own unique identity. Because of this, you can consider identifying trees by bark to be like other types of tree identification options. All you have to do is begin with a broad category of types of tree bark and then look at other characteristics. That way, you will be able to tell slight differences in bark types that look similar. Scaly: These are trees that have square-like bark pieces that overlap each other. Sitka and Blue spruce trees have very scaly bark. Trees that have scaly bark are shagbark hickory, strawberry tree, maple and river birch. This is the best maple tree bark identification characteristic you can find out there. Furrowed: This bark is the most common type of bark out there, and this is what most people think of when you talk about tree bark. Trees in this category will have chunky vertical strips of bark that have deep grooves. Trees with this type of bark are hemlocks, Redwoods and Doug-firs. Papery: Trees with this type of bark refers that looks like white paper. It’s easy to peel, and it’s easy to tear off in large pieces. It’s also very thin. You can see this type of bark on the Red Alder in the Pacific Norwest and on the White birch in the Northeast. Smooth: Trees with this type of bark often look like they don’t have bark. Most times, you will see small plates of bark on the tree that looks a lot like camouflage. The color of smooth bark trees is usually a light tan or whitish color. Aspens and sycamores are examples of the types of trees that have smooth bark. There are many tree identification apps out there, but not all of them are worth the download or investment. Some apps allow users to upload tree identification pictures and other details to help determine what type of tree it is. Here are a few identification apps that you can use with your smartphones. • Instantly learn the name of plants, flowers and trees with a picture. • PlantSnap automatically tells you when a plant is framed well. • Tap the screen where the flower is highlighted for the most accurate results. • Watch amazing Augmented Reality animations over a plant. • View information on a plant through an AR interface. • Our database is global and our results are instantaneous. There are currently 585,000 plant species in our worldwide database. • Our algorithm is retrained and improved every month using the 200,000+ anonymous images taken by our users every day. • PlantSnap will update automatically for you every time we add a new batch of species, no additional fees required. This app is a great tree identification by bark app because it allows you to identify the tree using any of its parts. This app was designed by Woodland Trust and is good for Android and iOS. This company was established in 1972. The primary objective of this organization is to protect the existing woodlands, restore older woodlands that have been in ruins and create new woodland territories. As a tree identification app, the Woodland Trust Tree Identification App is capable of identifying the 50 trees and shrub species native to the UK, and it can also help with identifying non-native trees. Virginia Tech’s tree identification app is by far a popular app that just about everyone interested in studying trees has discovered. Their extensive dendrology has led to a vast collection of tree identification pictures. Their tree-identification app allows you to retrieve their extensive data right on your smartphone (both Android and IOS). LeafSnap is a culmination of field guides that provides educational information about trees. The app is for IOS only, and it only includes a database of trees found in the Northeastern United States. The app is maintained by many scientists, developers and researchers from the Smithsonian Institution, Columbia University and the University of Maryland. Users get foundational tree identification information along with photos of a variety of species. The feature that really makes this app unique is the ability of the user to take an image of the tree the user wants identified (called the LeafSnap feature). The feature uploads the image and uses a sophisticated algorithm to recognize the species of the tree. The app has an interactive component that will collect your tree identification information and send it globally to professional scientists. These scientists will use this information to help them understand how various species are functioning in real-time. The ultimate FIELD GUIDE to TREES OF EUROPE and NORTH AMERICA, all in the palm of your hand! Download and you`ll get a comprehensive library full of facts, figures, and images. Learn where you can find certain species, how their leaves, flowers, and fruits look like and taste! Find inspiration and experience nature in a whole new way! Identifying trees is a viable part of forestry. Hopefully, this guide has given you more insight on the topic of study that helps us keep our woodlands populated, our air cleaner, our landscapes beautiful, our houses built and our yards cosy.